Fiandre tile combines comfort, innovation, and style into some of the most sought-after ceramic and porcelain tiles out there on the market. 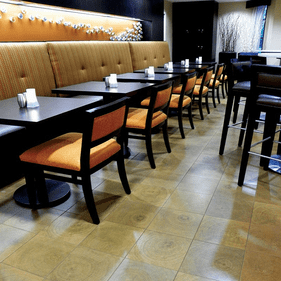 Since the 1960s, Fiandre has utilized its creative nature to show off ceramic and porcelain tiles that consumers can�t wait to install in their own homes. With a home base in Castellarano, Italy, Fiandre is at the center of world ceramic tile production. This gives them a strategic location to establish a broad distribution network throughout the world. With over 50 years experience, it is no surprise that the Fiandre name has come to signify elegance, sophistication, style, and class in the ceramic tile realm. Fiandre offers several styles that can be found throughout the world. We are proud to carry the Butcher Block collection, a unique take on the wood-look design. Rather than emulating hardwood planks directly, this collection takes its inspiration from the beautiful age rings found inside tree trunks for a remarkably unique appearance. Keep checking back with us, as more Fiandre styles are on their way.